The Tories' and Lib Dems' warm words on co-operatives are hollow; the resurrection of Northern Rock's failed ownership model underlines that point. You would have thought there were some clear lessons from the banking crisis of 2007/08… The need to reform bonuses to incentivise long term investment, not short term individual gain; the need for a meaningful split (in the near term) between the retail and investment arms of banks deemed ‘too big to fail’; the need for stronger regulation and oversight. Perhaps though the clearest lesson, if not one you have thought about before, is the banking crisis demonstrated the utter failure of Mrs Thatcher’s policy of demutualisation. A policy that led Northern Rock from a sustainable, community-focused model to a bank run and billion pound taxpayer bailout. Unfortunately George Osborne is repeating the mistakes of Thatcher by returning Northern Rock to the very same business model that led to collapse in 2007, rather than considering the Co-operative party’s plan to return the Rock as a new building society. In the 1980s, the Tories under Thatcher passed legislation which allowed building societies – financial organisations owned by their customers – to be turned into shareholder-owned banks. This is hugely significant because building societies such as Northern Rock, Alliance and Leicester and Cheltenham and Gloucester all used this legislation to become shareholder plcs in the 1990s. None of these building societies that demutualised is a stand-alone financial institution today; all were claimed by the banking crisis. The demutualised building societies were overly exposed to international credit markets, which went into seizure during the crunch. The long, snaking queues outside Northern Rock branches must be seen in the context of the history of demutualisation as well as the 2007 credit crunch. Short sighted demutualisations left these banks exposed and led to massive taxpayer bailouts. Mr Osborne has clearly not learnt this lesson of history. Instead of properly examining our idea of turning the Rock back into a building society, the government pushed ahead with a fire-sale that has left taxpayers short changed and exposed to future risk. This poverty of ambition and lack of regard to recent history is a mark of a government desperately scrambling for any ‘good’ stories they can find on the economy. 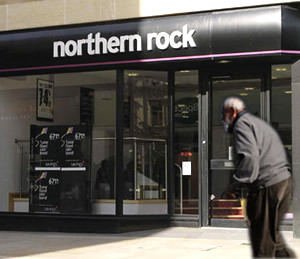 A mutual future for Northern Rock would have paid back taxpayers over time and reduced the risk of another banking collapse. Building societies were less affected than shareholder-owned banks during the crisis as their business model puts customers before the needs of short term profit for investors. Finally, the sale of the Rock today really underlines the coalitions’s lack of ambition on co-operatives and mutuals. The coalition agreement (pdf) had promised to “foster diversity and promote mutuals”. Instead, we have seen today that the Treasury is more interested in a quick buck than long term genuine diversity of financial service models. Time and again, the Tories’ and Lib Dems’ warm words on co-operatives are shown to be hollow; the resurrection of Northern Rock’s failed ownership model underlines that point. I don’t see why on Earth they’ve rushed to sell it off. Because Darling committed to have it sold off by 2013 and no one running an auction wants to get stuck with a gun to their head when bidders know they need to sell.